The fight against privatization and the closure of public schools in Sao Paulo has led to a massive student protest in 2015. 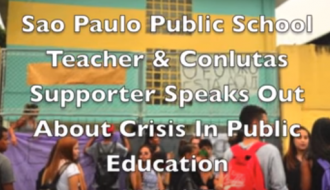 A Sao Paulo teacher Paula discusses what issues are facing public education in Brazil and the role of the IMF and World Bank. This interview was done in Sao Paulo on November 8, 2015.